I have a few items: FireSteel, Hatchet, etc. that have a small paracord size hole at the base. I was looking to add a length of paracord so I can easily loop it over branches, tentpoles, etc. Do any of you have a technique for doing this? There are several knots that can satisfy your needs. The most common knot for making a loop of cord is a double fisherman's knot. This is what most people use when tying cord for prusiks, abalakovs, etc. The disadvantage to this knot in paracord is you're not likely to get it untied. You'll probably end up having to cut it off if and when you want it off. 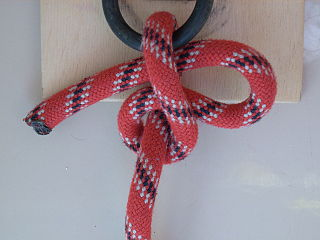 Another knot to use would be a single or double flat overhand knot. It's much easier to tie, as well as easier to untie, and it'll hold up well enough just for hanging your tools. 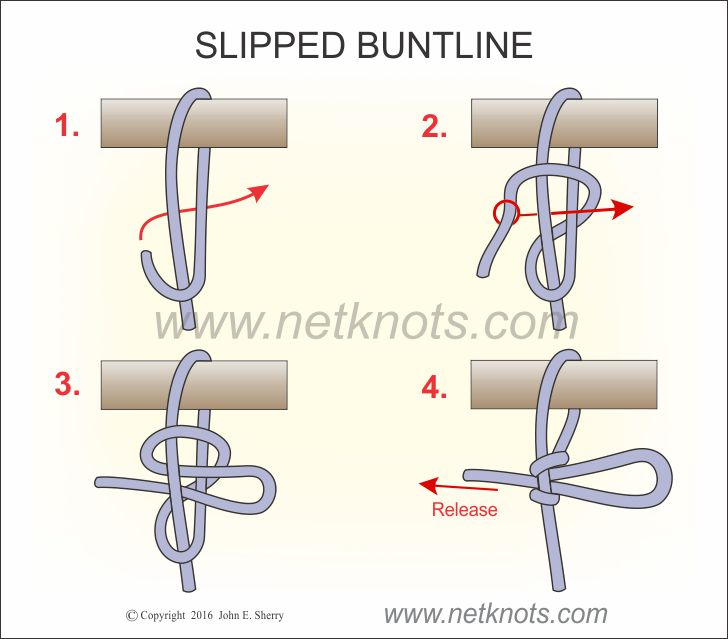 I currently use a series of a slipped buntlines and slipped overhand knots tied off with a chain sinnet to attach random gear to my backpack. Its much easier than it sounds. The key to a good buntline hitch is to properly set the knot. It forms a very compact clove hitch on the standing end when tied correctly. Doing one slipped will hold just as well and basically fall apart when needed. In step 3, simultainously pull the slipped bight on the right while bringing both parts (top and bottom) of the clove hitch tightly together. You can do this well away from the thing you're attaching it to and then 'slide' the whole knot down to cinch it against your equipment/loop/etc... When set correctly, its very secure (my goto for virtually everything). I'll take a 2 foot piece of paracord and tie either a normal buntline (if I don't want it to come off) or a slipped buntline through the hole on the equipment I want to attach. I've even done this with accessories like hats by taking a small "bunch" of the material and tying the buntline around that. Pull this bight/draw loop tight and hold it with one hand/thumb while finishing it off with a chain sinnet. A chain sinnet is basically where you take the rest of the working end and pass a bight through the current drawn loop/bight, pull it tight, move your fingers to hold that knot tight and repeat until you have no more working end left. Once you get used to this system of knots, you'll be able to hang any gear on almost anything securely, quickly and without much thought. I use this same system (together with a trucker's hitch most of the time) for all knot tying/securing situations. Never failed me yet. Not the answer you're looking for? Browse other questions tagged gear knots or ask your own question. Is there a device to hook anything on a branch? What do you call a long-handled hatchet?